He also urged the Kingdom's authorities to cooperate with investigations into the murder of critical Saudi journalist Jamal Khashoggi. He was killed in the Saudi consulate in Istanbul last month, in what Turkish prosecutors said was a pre-planned strangling by forces linked to Saudi's controversial Crown Prince Mohammed bin Salman. After initial denials, Saudi officials admitted it was premeditated but said the Crown Prince did not know in advance. Mr Hunt is the first British minister to visit Saudi Arabia since the journalist's death. He met country's King Salman before seeing the Crown Prince, who is effectively the ruler. Mr Hunt also met other regional leaders, including senior ministers in the Yemeni government. Ahead of his trip, Mr Hunt said he would press for all sides in the Yemen conflict to find a political solution. Saudi Arabia has led a regional coalition since 2015 supporting Yemen's internationally recognised government against Iranian-backed Houthi rebels, but it is accused of killing many civilians and worsening near-famine conditions with its air strikes. The UK government is also under pressure from Opposition parties to halt Britain's lucrative arms sales deals to Saudi Arabia. 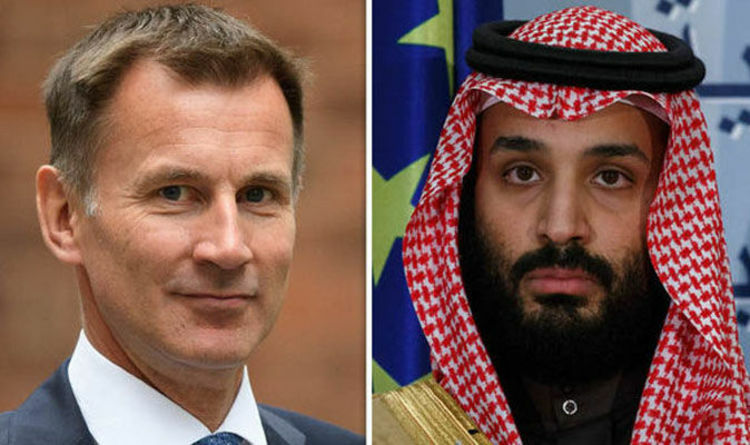 Before his visit, Mr Hunt also said the international was united in "horror and outrage at the brutal murder of Jamaal Khashoggi" and he wanted Saudi authorities to cooperate fully with Turkey's investigation into the death. Mr Hunt's visit was accompanied by a lull in air strikes on Houthi positions and street battles in Yemen's main port city of Hodeidah, which is crucial for getting food into a wartorn country now on the brink of all-out starvation. Observers hoped it was a sign of de-escalation as western allies press for an end to the war. But Saudi coalition spokesman Colonel Turki al-Malki insisted: "The operation is still ongoing. It's not true that there is a ceasefire in Hodeidah."